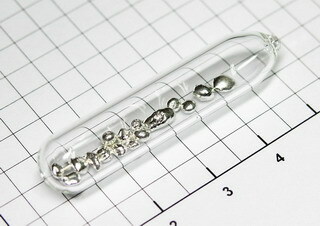 Glass bead doped with 2% Nickel2+ Ions - NEW! the Ni2+ ions cause this yellow brown color. Glass bead doped with 2% Iron(II,III) oxide - NEW! the Fe3+ ions cause this chocolate brown color. 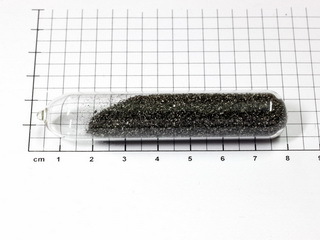 High pure granules sealed under argon to protect them against oxidation. This powder resulted from cutting 99.9% pure Lanthanum metal. It may contain impurities of iron and should be used in experiments where purity is not mandatory. Nevertheless the powder has a metallic-grey shine. 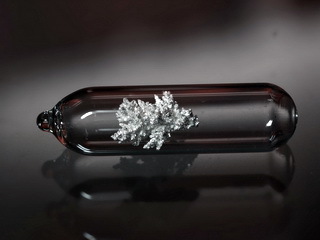 A sample of pure 99.9% Silver crystals sealed in ampoule under argon to protect it from oxydation. This is the only way to keep silver shiny and bright. Very nice Bismut Crystals- 99.999% purity! Quite rare in this dendritic crystalline form! Highly shiny and oxide free. 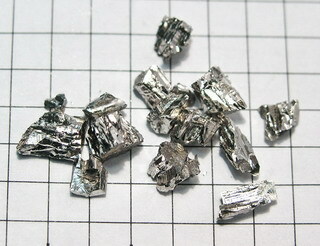 This hafnium is very pure, >99,9% with a Zirconium content ~ 1%!